I just spent the past twelve consecutive hours helping our recent high school graduate pack for a trip. We’ve ziplocked every liquid, rolled every pair of pants, double checked needed meds and triple checked the overall list. The Missus is feeling prepared but what she’s really tickled about is a particular travel bag she’s taking.I haven’t shared a DoAhead Destination in awhile so I thought today’s post should be a quick pic and link to the favored item! 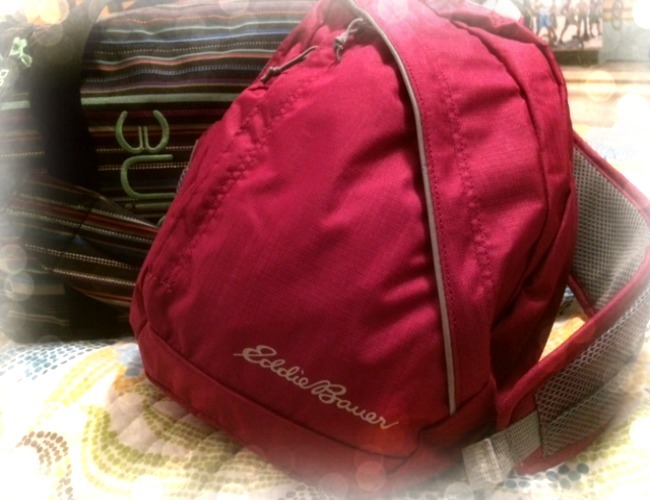 Drum roll please for the Eddie Bauer “Cruiser Sling Bag”. She received the backpack from friends who had used the bag when they had taken a trip to Europe. They said it was indispensable. As she tucked away needed items in various compartments she decided she couldn’t agree more. The backpack quickly became a hit. She’s counting on the wide sling to eliminate sore shoulders. It’s petite size should also keep items on store shelves safe. Large backpacks are great but a false move can find a tourist in the land of “you break it, you pay for it”! Hehe. Separation anxiety right there. Aw, How time flies, huh?